The lavish Ludlow Bed by Modloft exudes a commanding presence that makes you feel as if you're waking up to the grandeur of Versailles every morning. 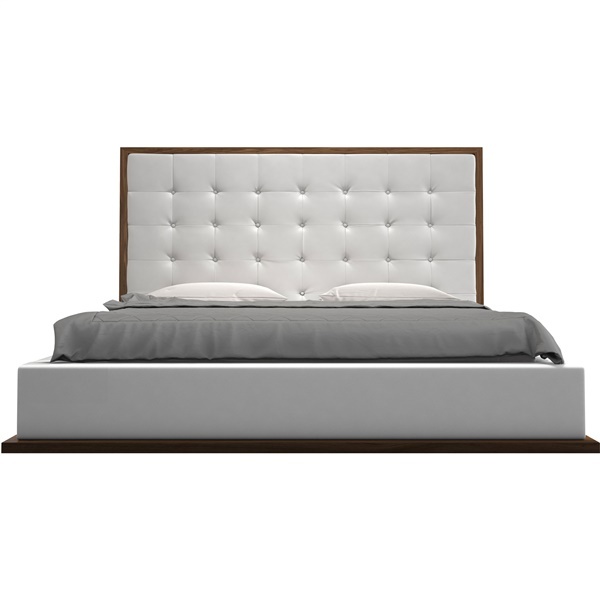 The modern bed frame is defined by its expansive headboard wrapped in luxurious Eco-leather and accented by meticulous button-tuft detailing. A wooden border along the headboard and the bottom edge of the frame enhance the bed's fresh, contemporary look while a flat, platform base adds hip, urban style to any updated space. Offering as much comfort as style, the Ludlow Bed is equipped with a solid pine-slat base for surpassing durability and exceptional support. Choose from a variety of wood finish and leather color combinations to create a look that matches your taste and your bedroom's d�cor.